Are you ready for an exciting adventure? 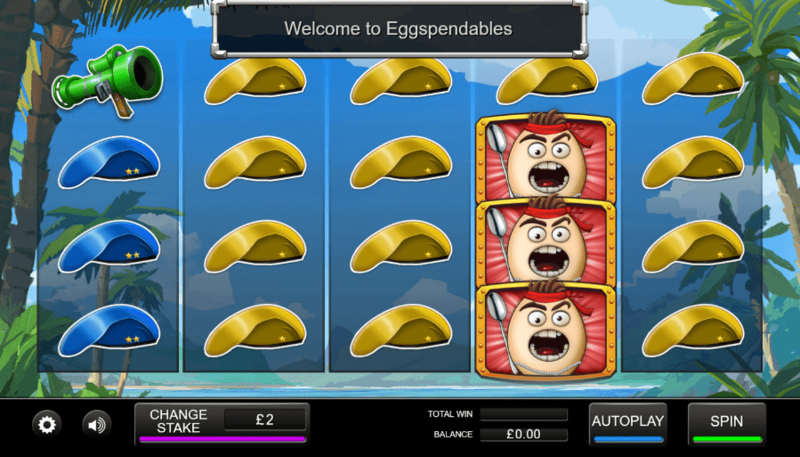 Eggspendables is a fun adventure-themed online casino game created by Inspired Gaming with 5 reels and 20 paylines. Set in the depths of the jungle, you'll join the Eggspendables on their latest quest to get rid of all the bad eggs for an incredible cash reward. You'll be able to fight with various weapons including grenades, helicopters, and army tanks to help conquer your quest. 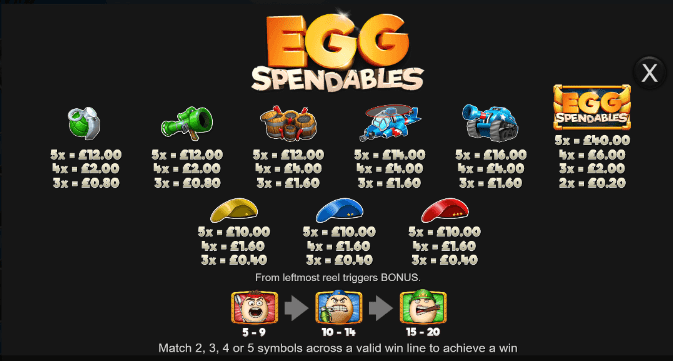 There are many entertaining features in Eggspendables including Eggspendables free spins and a sergeant bonus feature. Eggspendables is a fun slot with a hilarious egg theme. Eggs are at war and you will join the Eggspendables on their quest to get their land back on slotsbaby.com. This 5 reel, 20 payline slot has a great design with hilarious egg characters. This online slot is set in the middle of the jungle surrounded by tall palm trees, calm crystal blue sea, mountains, and cloudy skies. The highly animated eggs make the game so much fun, there's a sergeant, lieutenant, and a general. Symbols include egg army characters, blue, yellow, and red egg shells, guns, grenades, and other explosives. Re-Spin Feature - At any point during gameplay, mystery symbols can lock into place. These mystery symbols will award you with a re-spin. Lots of re-spins can be won here and the feature ends when no more mystery symbols land. Sergeant Bonus - Landing 5 or more sergeant eggs will activate the sergeant bonus. Once activated, you will be taken to a new screen where you will see a wheel of fortune that is made from silver spoons. The spoons are attached to multipliers of between 3x and 10x your total stake. Lieutenant Bonus - Landing 10 or more sergeant symbols will unlock the lieutenant bonus. Here you will be given 6 free spins. All lieutenant symbols landing in this feature will benefit from itself turning into a wild. Two extra wilds will also be added to the reel. General Bonus - Landing 15 or more lieutenant eggs will trigger the general bonus. Here you will be rewarded 15 free spins. New bonus symbols will also appear on the reels. If you're looking for a hilarious and unique game, then Eggspendables is the slot for you. Eggspendables has an innovative and unusual theme combining eggs with the army. The 3D animations are so much fun and the sounds of gunshots, eggs splattering, and army trucks get you into the zone. The bonus features are exciting as you have to work your way up to the top. For the best cash rewards, you need to activate the general bonus. click here to find out more.